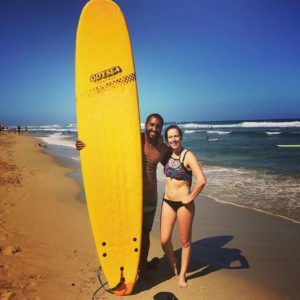 Private Surf Lessons | Kele Surf School |Encuentro beach | Cabarete | DR.. The semi-private surf lessons consist on 1 surfer with 1 surf instructor per lesson. If you are a beginner who wants to learn how to Surf and get yourself standing up in the very 1st day or if you are a advanced surfer who wants some advise to improve your surfing skills come to Kele Surf School, Cabarete the capital of surfing in the Caribbean and learn how to surf with a patient, dedicated, fun & energetic surf instructor that will give you that extra attention you need. Additional info, questions and comments. Our mission is to introduce surfing as a safe, easy, fun, positive, recreational sport for the whole family and also can take advantage of all the great benefits of SURFING to physical and mental health. Copyright © 2016 Kele Surf School.